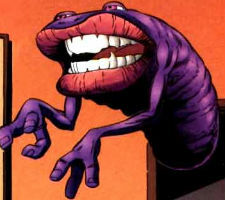 NOTE: Flaptrap is created by Erik Larsen, with help from Keith Giffen and Victor Bridges. Flaptrap was created by Chelsea Nirvana shortly after she obtained the powers of Johnny Redbeard. She and the Inhabiter needed some superhuman back-up and made the Henchmen, recruiting criminals that had previously served her father, Dr. Nirvana. These enforcers accompanied them and Freak Force in liberating the M.M.M.S. camp to form a large army of freaks. Following the liberation of the M.M.M.S. camp, the Henchmen were folded into the army led by Chelsea Nirvana. They attempted to seize control of the Vicious Circle during the Gang War but ultimately failed. Flaptrap was one of a group of freaks whose heads were blown up from afar by CyberFace.